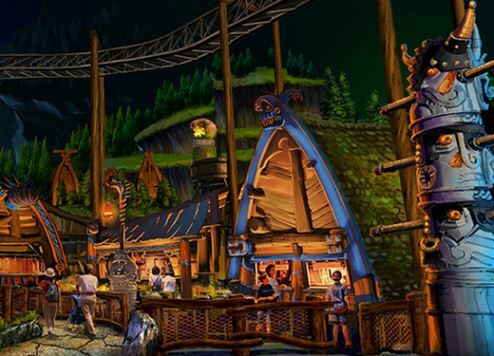 MOTIONGATE Dubai movie park at Dubai Parks and Resorts has unveiled a new zone based on How to Train Your Dragon, the award-winning animated franchise from DreamWorks Animation. The How to Train Your Dragon Land features fully-immersive rides and attractions that include the Swinging Viking, a thrilling ship-based adventure; Camp Viking, an interactive, adventure play area with crawl netting, dragon training tools and duelling Viking ships; and action-packed rollercoaster Dragon Gliders. The latter is a Dubai first, incorporating the latest in next-generation ride technology to create a multi-sensory, action-packed experience. Dragon riders learn to fly with film characters Hiccup, Toothless, Astrid and Stormfly on their very own Dragon Glider as they take an exhilarating journey to the secret Forbidden Isles. Featuring new, never-seen-before content created by DreamWorks Animation exclusively for MOTIONGATE Dubai, plus state-of-the-art programmable ride systems, 360-degree rotating ride vehicles, built-in audio, massive multimedia projections and more, the rides are set to rank among the park’s most memorable attractions. How to Train Your Dragon Land is just one of the four lands included in the DreamWorks Zone at MOTIONGATE Dubai. The other three are based on the studio’s popular blockbuster animation hits including Shrek, Kung Fu Panda and Madagascar. MOTIONGATE Dubai is part of Dubai Parks and Resorts, the Middle East’s largest themed destination, which also features Bollywood Parks Dubai, the region’s first LEGOLAND Park and a LEGOLAND Water Park. The entire destination is connected by Riverland Dubai – a retail and dining destination at the heart of Dubai Parks and Resorts and also includes the Polynesian-themed Lapita Hotel. The destination’s fourth park, Six Flags Dubai, will open in 2019. Dubai Parks and Resorts recently introduced a special summer pass. The dxbpass offers visitors the chance to experience the three theme parks, as well as Hub Zero, Mattel Play! Town, Green Planet, Splash Pad, along with a 20 percent discount on selected restaurants at Riverland Dubai and Lapita Hotel. The offer is available until August 31.